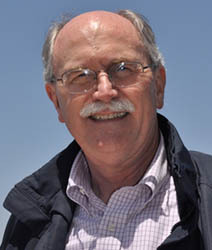 As a member of the Board, Bill Heard also serves as the Foundation’s Public Information Officer. He is a retired Navy Reserve captain with almost 30 years’ experience in Navy public affairs. Earlier, he served eight deployments in Vietnam from October 1966 to May 1968, while his ship was operating along the coast of Vietnam. Heard’s decorations include the Combat Action Ribbon, Meritorious Unit Citation, Vietnam Service Medal, Vietnam Campaign Medal, and Naval Reserve Medal. Heard’s professional background includes 40 years’ experience in public relations counseling in government, corporations, and advertising and public relations agencies. Early in his career, he was a newspaper, television and radio reporter and editor. He is a journalism graduate of Texas Tech University. Heard retired in December 2007 after 15 years as a media relations officer and manager of employee communications for the Los Angeles County Metropolitan Transportation Authority (Metro). He lives in the Point Loma community of San Diego.